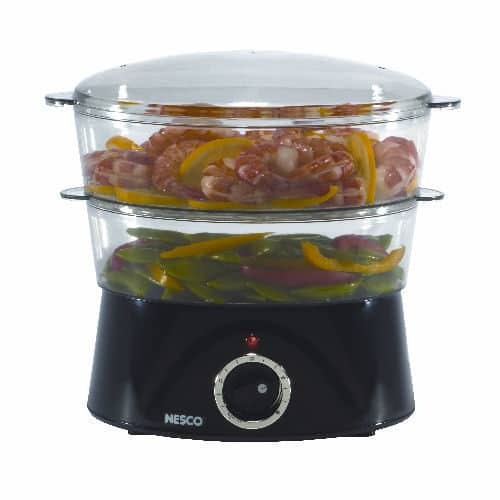 For a healthy, convenient way to delicious meals in minutes, this Nesco® Food Steamer is a great countertop appliance that can cook rice while simultaneously steaming vegetables, meat, or seafood and more. As people are becoming more health-conscious, steam cooking is gaining popularity once again. Steam cooking is one of the best cooking methods for maximizing taste and color, while retaining more valuable nutrients for a healthy diet. Steaming is a gentle, moist, cooking method, making it ideal for delicate items, such as seafood. Foods are not immersed in water, therefore preventing a major loss of vitamins and minerals which would normally be “tossed out” with the cooking water. 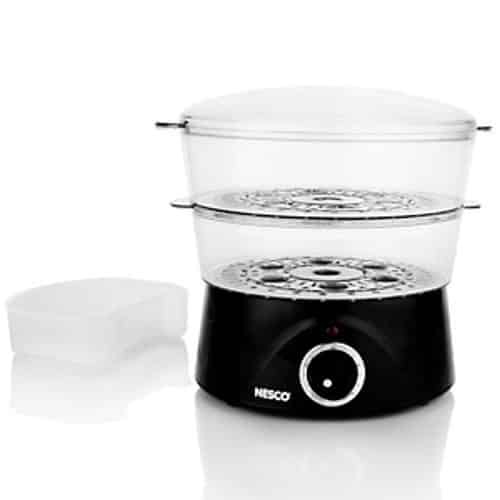 Healthier, more nutritious foods may be easily prepared using the Nesco® Food Steamer. The end result will give you an eye-appealing, flavorful meal.